Ok, so its an All Terrain Vehicle (ATV) and not a motorcycle. But its close. I bought the TRX250 back in the fall 1986 and it is incredibility fun to ride and will go just about anywhere. I used to have a Honda Odyssey FL250 buggy, but it was not well suited for the rough terrain of Nova Scotia. The FL250 was also noisy and didn't have reverse. It was really meant for the California sand dunes. It is rear wheel drive only with no differential. The engine is air-cooled and has a 248cc displacement. The transmission is a semi-automatic (foot shifter with no clutch lever) 5-speed and reverse. It has a thumb throttle and not a conventional motorcycle twist grip. Front and rear brakes are drum units and are operated separately through hand levers and rear brake from a right foot lever as well. Once in gear you have full control at the handle bars. Handy when you need to mover some weight further back when in mud. The headlight is also removable to double as a work light. The wire is coiled under a cover under the headlight. I've added some equipment to the TRX250 to make life easier. Carrier - on the back is a 4" diameter PVC tube mounted to the standard rear carrier. I keep a 2ton come-a-long and 40m of rope in it in case I get stuck in the mud. The tube has end caps with pins to keep from losing everything. Cooling Fan - I made my own cooling fan using a Honda Accord radiator cooling fan. A separate fused circuit was added for the fan with a relay and switch on the left handlebar for turning it on and off. I added the fan since snow plowing was done at low speeds and didn't provide sufficient airflow over the engine. It also comes in handy on hot summer days. Snowplow - on the front are some brackets for the snowplow. The lift lever mounted on the left side of the bike. Dad's driveway is double and about 35m long so that came in real handy. More fun than shoveling as well! The bracket stays on the machine and the plow and lift lever can be installed or removed in less than a minute. Trailer Hitch - the original trailer hitch caused the machine to get hung up on rocks quite often. Rather than removing and installing it all the time, I made a new hitch which is basically like the old one, but inverted for more ground clearance. Now I never get hung up on rocks. I always make a point of washing it after every trip since I like working on a clean machine when performing regular maintenance. But it hasn't been used much since I moved to Toronto. 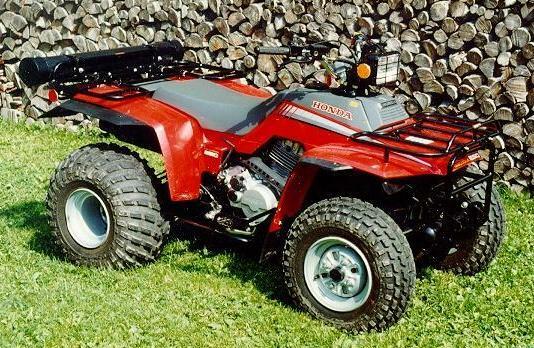 I sure wish someone made scale models of the '86 TRX250 or any other ATV. All Terrain Vehicle Association of Nova Scotia - Promotes safe and responsible ATV riding, training, maintain and gains access to public and private land, club organization, and insurance coverage.